Located at 4.2 km from the Lake Pichola, Devendragarh Palace (As a Luxury Paying Guest House) offers breakfast and Wi-Fi internet access to its guests. The Udaipur City Railway Station is at 3.7 km from this Udaipur guest house.This 2-storey property has AC rooms equipped with tea/coffee makers, refrigerators, TVs, and attached bathrooms.This Udaipur accommodation provides travel assistance, laundry service, and room service to guests.Some of the tourist spots that guests can visit during their stay at Devendragarh Palace (As a Luxury Paying Guest House) are the Monsoon Palace (6 km), Fateh Sagar Lake (4 km), and Shilpgram (2 km). The Udaipur City Bus Station is at 2.7 km from this property, whereas the Maharana Pratap Airport is at 22.5 km. Guests can avail of car- and bicycle-rental service at this accommodation. These beautifully designed lake facing rooms are designed in traditional decor. Equipped with a separate sitting near the window, these centrally air-conditioned rooms have a comfortable bed, wireless connection (charge), iron/ironing board (request), premium bathrooms, a self grooming makeup mirror, refrigerator, a telephone, bottle opener, wakeup calls service, bottled drinking water and hot/cold running water. Reason For Rating : Nice Place, lake facing, good rooms. Reason For Rating : Service very good, location amazing, staff very helpful..
Reason For Rating : Very Good property at beautiful place. Good staff. Found dinner little expensive. Very comfortable stay. Thank you. What's Good: Best place to stay in Udaipur. Reason For Rating : Awesome experience to stay in Udaipur. Friendly staff, lovely food, all happiness under one roof. We will be visiting this place again in future & Devendra Garh Palace will be the place for stay again. Thanks to Ruchika Mam for the advice & support through out the stay. What's Good: It was an awesome experience staying in Hotel Devandra Garh. The facilities and room amenities were excellent and very clean. Food was awesome and the staff very polite, soft spoken yet very quick. The hotel is beautifully managed by the owner of the property Mrs. Ruchika Hiran who gives it a very personal touch to your visit there. Highly recommended esp for families. "Devendragarh Palace (As a Luxury Paying Guest House)"
As a frequent traveler , apart from the property I always give preference to the professionalism . Booked this property from my parents for 1 night stay after reading the fabulous reviews . However I was disappointed to learn that my parents were not allocated the room till 12:45 when the checked in time was clearly mentioned by 12. On calling I found out the the previous guest could not check out on time since the child along with them was unwell . I totally understand this but what the hotel couldn't see was that my mother was equally unwell and needed to check in at the earliest. I believe hotel should atleast have the courtesy to call their guest beforehand ( 1 hour or so) and update them which they failed to do so . Secondly in such a situation , my parents were simply asked to sit in the reception area till the room was getting ready. How about little courtesy to ensure that they are atleast comfortable while waiting ? Since I don't believe in only mentioning the negative points , the property was good with nice view of the lake and rooms even thought standard was neat and up to the mark . Just wished it could have been a better stay . Really enjoyed my 4 days here recently. First room given was not so good but as soon as i mentioned it I was immediately moved to a very nice replacement. Owners and staff were very attentive, friendly and helpful, especially Kumesh. It is a very relaxing place to stay being away from the bustle of the town but only 10 minutes in a tuc-tuc. Lovely views the lake from the gardens. I am sure I will be back very soon. 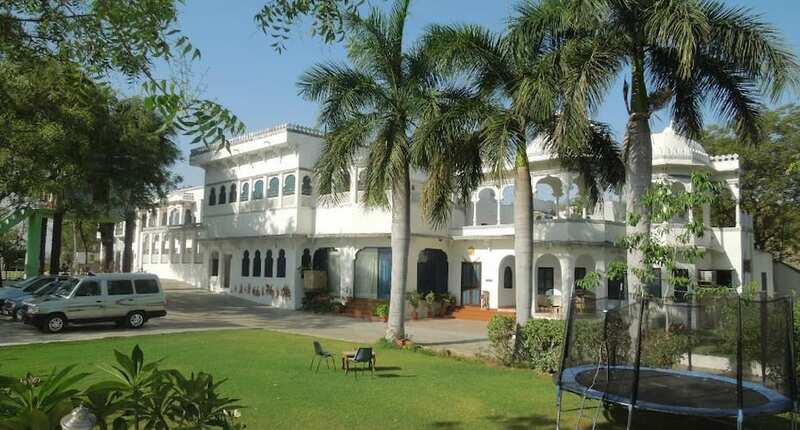 Felt like a king, with the whole property of around 3 acres to yourself, facing the lake, with the most stunning sun rise, beautifully maintained gardens, having different fruit trees, and flowers, a choice of swings, tree house, a clean and inviting swimming pool and lots and lots of birds. This is what you get extra with the special services of Mrs Ruchira and her team. Excellent food served with love and at the setting of your choice. Big and clean rooms with all facilities. Added to it, was the vintage car collection of Advocate Hiran. I feel no other facility in Udaipur would have given all which has been given by Devendra Garh. My personal thanks to Mrs Ruchira for the special things organised to make our anniversary special. Breathtaking lake view, service, food and personalized touch from the host. Definitely, my second home in Udaipur. This was my second visit with a group of 15 people. Everything was very well organized and taken care personally by Ruchika. She is a great host. Most competitive prices with an amazing view of Udaipur. This was a wonderful experience for us , kind of a homestay and wit absolute comfort of that of home. Room was quite big and spacious with beautiful interiors. Ours was Blue room. Bathroom was again very big and spacious but the water pressure was slow. Food at breakfast was just awesome. Limited menu, but every single thing tasted heavenly. Since it was very cold, rooms were provided with heaters. Excellent hospitality. The owner herself had a very good interaction with all the guests. Overall it was a wonderful experience. We stayed for two nights. There are lot of steps to the rooms, so elderly people might find difficulty. Otherwise it's a beautiful property just next to Fatehsagar lake, its neatly maintained too. I feel bathroom should be rennovated. Best view from Green and Blue room. I could sit there for hours.